Spring is on its way (I can hardly remember last time I rode on asphalt) and, even though it still is a bit chilly in Stockholm (between -10°C and 0°C), it’s time to think about warmer rides. I ride clipless all year round and finding the right shoes, commuting shoes especially, is not that easy. “Standard” clipless shoes are usually designed for lycra-clad roadies and, the fact of not being warm enough for winter aside, don’t do any good to the everyday cycling community. No I don’t want to look and sound too much like an idiot when I’m at the museum after a short after-work ride. For the cold and wet winter rides I use my Five Ten Cyclone shoes which I find water and windproof enough but more importantly warm even when it’s -10°C and below. But those shoes are a bit heavy and look rather massive so I wanted something lighter and more casual for summer. 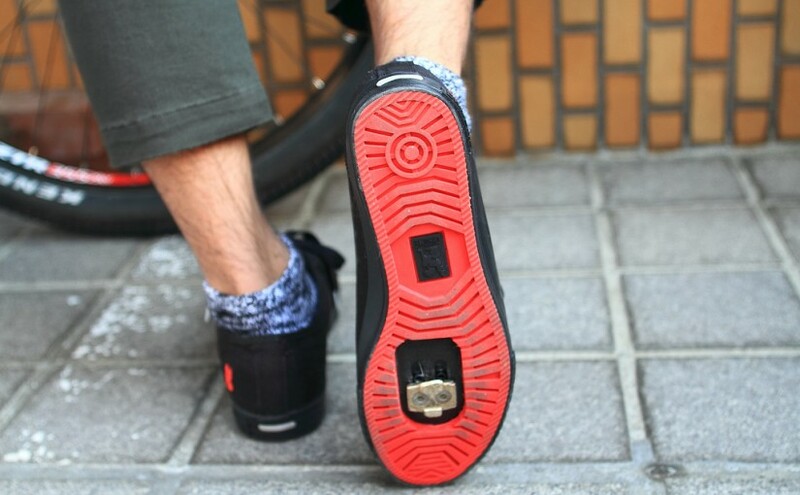 There are basically two brands that make casual (sneakers like) clipless shoes: DZR & Chrome Industries. I tried a couple of DZR models but did not really feel comfortable in them. Instead I found the Chrome Kursk Pro to be exactly what I needed. Be careful if you’re going to order on-line because Chrome’s sizing is a bit off: my Five Ten are 7.5 (US) and I had to order 6.5 (US) for the Kursk Pro. I ordered the shoes from Tokyo Fixed (in London) last Friday and they were delivered to me yesterday (pretty quick). I could not resist and took them for a ride this morning. They are a bit stiff compared to the Cyclone but they’re new and the Cyclone are already a year old so it should get better. They are light (so much lighter! ), well finished and mounting the Crank Brothers cleats was very easy. One remark to myself though: spring is on its way BUT has not yet arrived and those shoes are definitely not warm enough for sub-zero temperatures! I guess I’ll have to ride with the Five Ten Cyclone for a while longer.